If it is Xmas Tree Decorations to be sent anywhere in the UK you are after than look no further than Booker Flowers and Gifts Liverpool UK. Our Tree Decorations are specially selected from across a range of suppliers. This way we can bring you the very best of what is available in Tree Decorations. Here at Booker Flowers and Gifts we love Xmas and as such we have a massive range of traditional and contemporary Xmas Decorations. Gisela loves Xmas Gisela Graham Limited is one of Europes leading giftware design companies. Gisela made her name designing exquisite Xmas and Easter decorations. However she has now turned her creative design skills to designing pretty things for your kitchen - home and garden. She has a massive range of over 4500 products of which Gisela is personally involved in the design and selection of. In their own words Gisela Graham Limited are about marking special occasions and celebrations. Such as Xmas - Easter - Halloween - birthday - Mothers Day - Fathers Day - Valentines Day - Weddings Christenings - Parties - New Babies. All those occasions which make life special are beautifully celebrated by Gisela Graham Limited. Xmas and her love of this occasion is what made her company Gisela Graham Limited come to fruition. Every year she introduces completely new Xmas Collections with Unique Xmas decorations. Gisela Grahams Xmas ranges appeal to all ages and pockets. Gisela Graham Xmas Tee Decorations are second not none a really large collection of very beautiful items she is especially famous for her Fairies and Nativity. If it is really beautiful and charming Xmas Decorations you are looking for think no further than Gisela Graham. 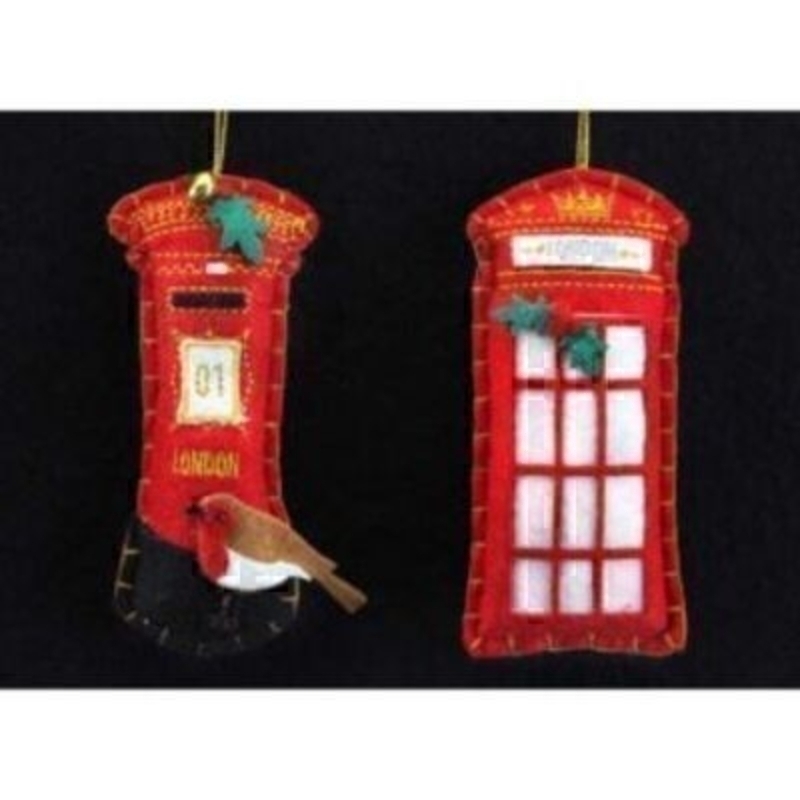 These felt Xmas tree decorations of Telephone box or a post box by Gisela Graham add a fun twist to traditional Xmas Tree decorations by Gisela Graham will fit in with many Xmas themes You can choose the Letter Box or the Telephone box or if you are anything like us you will want them both. Remember Booker Flowers and Gifts for Gisela Graham Tree Decorations that can be send anywhere in the UK.